This is one of the unique bouquet at the house of Winni which consists of 16 Ferrero Rochers. It is a perfect treat for the sweet tooth of your near and dear ones. 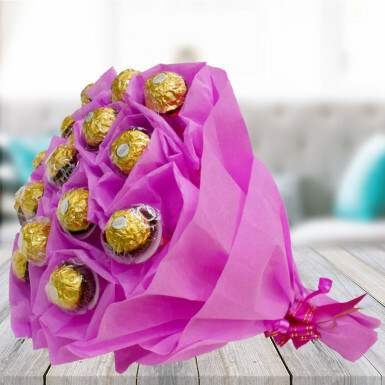 Chocolates are all time favorite of everyone and this unique bouquet will surely win the heart of the receiver. The crunchy and crispy taste of these chocolates can make any taste bud go crazy. It is the perfect gift for every occasion. Convey to your beloved that you are head over heels in love with her by sending this delicious bouquet. So, go ahead and place your order now!